I’m obsessed with rhubarb. Every spring, in the short eight- to ten-week window of the season, I load up on stalks of rhubarb at the market. There's something I love about those reddish pink stalks, and their refreshingly tart flavour. I often like to roast the rhubarb with a bit of sugar and lemon juice to make a quick and easy compote, and serve it with my morning yogurt and granola. 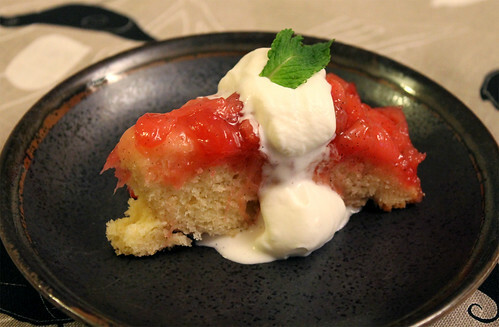 But when I came across this recipe from Saveur Magazine for a Rhubarb Upside-Down Cake, I couldn't resist with the fabulous local rhubarb at my disposal. 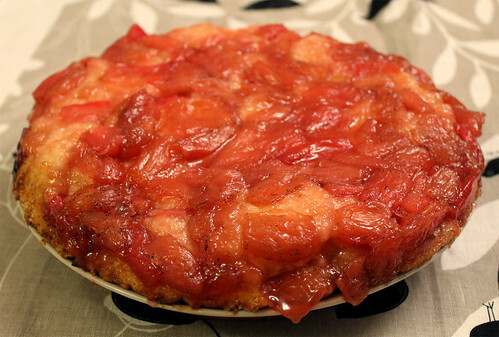 This cake is prepared à la tarte tatin method, in which the rhubarb is caramelized in a cast-iron pan before the batter is added and baked in the oven. At first, I was worried the cake wouldn’t turn out, as the batter was super thick and hard to spread around the pan. What I ended up with was a pretty sloppy looking cake with syrup seemingly running everywhere before it went into the oven. But I decided to let it do its thing, walked away for half an hour, and when I came back, the cake baked beautifully! The crumb of the cake is rather dense, almost like a shortcake, with the sweet hint of vanilla. The caramelized rhubarb on top is melt-in-your-mouth tender, and the tartness counterbalances with the sweetness of the cake perfectly. 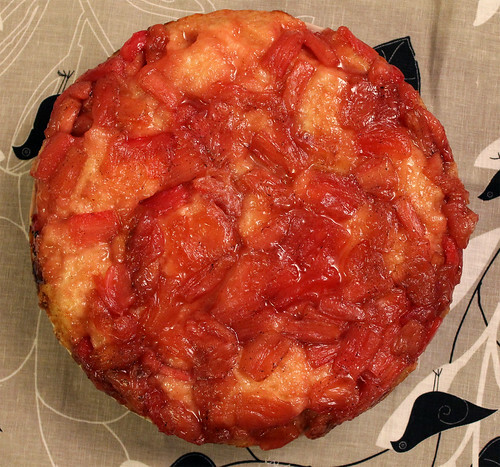 Get the recipe for Rhubarb Upside-Down Cake from Saveur Magazine here. food recipes July 1, 2013 at 11:02 a.m.
Mmmmm cake looks delicious and tempting.